Yikes! I've got so many things to do these days. The Man decided would should have a 4th of July party, which means we've got to get the house in order. This is a bit of a problem for me, because since I've started blogging and tweeting and working my Etsy shop, well...let's just say I've let a few things slide. I mean, there's only so many hours in the day, right? And with all these other important things, like blogging and tweeting and working my Etsy shop...OH! and playing with my kids..., well the housework has taken a back seat. I've been dying to get my sewing machine out for a while. I like to sew stuff for the house. I'm not that good at it, but I enjoy doing it. And I think it's good for me. I'm a bit of a perfectionist, and sewing constantly teaches me to embrace my little imperfections. (Or at least that's what I tell myself.) Well, a couple of weeks ago, I stumbled upon Odds & Ends' blog (I sure do wish she'd blog more, hint, hint). She had a link to a tutorial on turning plastic shopping bags into fabric by fusing bags together with an iron. At last! Something to do with all those shopping bags that I can't put in my recycle bin!!! Oh happy Day! (Yes, I use 'reusable' shopping bags, but no matter how I try, I still manage to amass way too many of the plastic ones.) So...since I had the sewing machine out, I might as well have a little fun and try something new, right? Voila! A fun little cover for my DayTimer! The 'fabric' shrunk quite a bit - probably because I didn't have the iron set right and because I forgot to flip everything and iron the front AND the back. I'd already pretty much ironed the hell out of the front trying to get all the layers to fuse together before I remembered I was supposed to iron the back too. 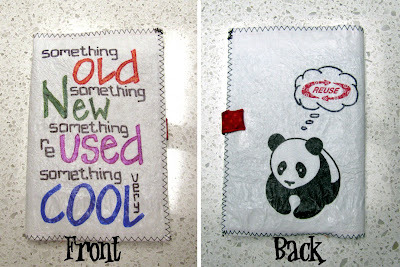 I wasn't sure if drawing or writing on the bags before fusing would work, but it worked just fine. I used Sharpie markers for the text and the panda's thought bubble. I drew them on a white bag and then used a clear produce bag for the top layer so the ink wouldn't come off during the fusing. Worked like a charm! I also wasn't sure if I could cut out images and place them under the clear top layer. I thought it might be really obvious that I was 'cutting & pasting'. But again, this worked great. I used fusible interfacing on the back of the 'fabric' to stiffen things up and give a more stable sewing surface. I also used it to extend my fabric with the red ribbon on the inside flap (to resolve the shrinkage problem). I wasn't sure if the interfacing would fuse to the bags, but it worked perfectly! It was a really fun project, and it didn't take long at all. I'm going to do it with the kids next time -- let them cut pictures and words out of the bags, draw on them with markers, etc. I don't know what we'll do with the 'fabric', but I'm sure we'll come up with something very cool. It's very cool!! I love the little panda!! Panda compliments of Panda Express carry out. I love him too. I've always tried to do the daytimer gig, but fail miserably at it. Which makes absolutely no sense from this OCD/ADD dad, wait yes it does, the later of that ADD. LOL Anyhow, I want to know more of this squirrel you have, sounds like an interesting story! And, no worries we are having a '4th' gathering of family, yikes! Needless to say we are not ready either. btw the panda rocks! Cheers! You should totally sell some in your shop. there FAB! That's great, I am most impressed. I agree, where does the time go once you start blogging and tweeting and playing with the kids.....thanks for dropping by at my blog and leaving a comment. Most appreciated. Happy 4th July. Turned out great! Thanks for the tips. I've been wanting to try it, but have been a bit nervous about it. Wow that's fantastic! 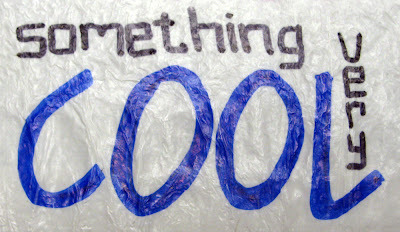 I've been doing the fused plastic thing for a little while but it never occurred to me to draw on the bags! I've only been doing the cut and paste and that's a bit limiting... anyway, thanks for posting and GREAT JOB!